5 CDs. 5:44 hrs. Listening Library. Jan. 2018. $45. ISBN 9780525531319. digital download. Gr 4 to 8—T'Challa is the prince of Wakanda. He grew up with his father, Black Panther. When things heat up at home, his father sends him to America for safety with his friend M'Baku. The boys attend a Chicago high school, where the class bully, Gemini Jones, becomes possessed by a dark, evil magic. To save the school, T'Challa must don the tech suit and vibranium ring he was given for emergencies. Can he keep his secret identity and save the day? Dion Graham's voices are unique and easy to distinguish. Graham does a great job with pacing and building of the characters. The masterful portrayal of the feelings of drama, angst, adrenaline, and worry will hook listeners from start to finish. The plot is engaging, well written, and draws the listener into the world of the Black Panther. 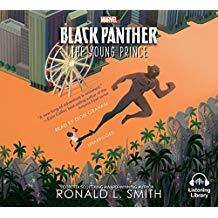 VERDICT This audiobook is sure to delight fans of the Black Panther, S.H.I.E.L.D., Avengers, and other superheroes. A must-have purchase for any library collection.